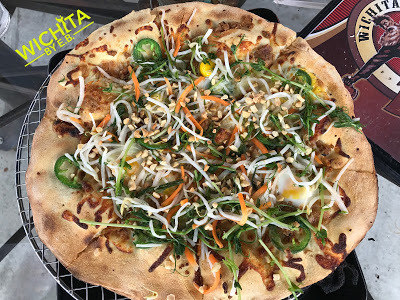 Wichita Brewing Company’s Pizza of the Month: Farm Thai Pizza – Wichita By E.B. Since the beginning of the year, Wichita Brewing Company has been inviting restaurateurs to invent a pizza that will be served at both their West side (8815 W 13th St) and East side (535 N Woodlawn) locations. They are allowed to create whatever their heart desires. Unfortunately, I haven’t been able to make it out to try the previous eight inventions but September’s pizza of the month caught my eyes. It is a Farm Thai Pizza created by local produce seller, Jimmy Vo at Kan-Grow Hydro Farm who services many restaurants around town. The base is a Thai peanut sauce made with real peanuts. It also has Kan-Grow’s award winning Thai sausage with jalapenos, Yum Yum mix, pea shoots, mozzarella, and six quail eggs on every pizza. I love Thai food and I love pizza so for $12, this was a no-brainer. It didn’t take long for our Farm Thai Pizza to come out of the wood assisted oven. Once it made it to our table, I just stared at it for a while for no reason. It looked light yet filling and to nobody’s surprise; it was just that. All those who had it were fans. The jalapenos were sporadic enough that it wasn’t too hot; the quail eggs were also fairly sporadic on the pizza as well. None of the toppings stuck out so much that it stole the flavor away. It was an incredibly well designed pizza and something I’ll be ordering to go in the near future. The only reason I say “to go” because for my friends and I who stopped by the service at WBC was a little slow (outside of the pizza) as well as snarky. Drink orders were slow and this was in the middle of the afternoon. One of the bartenders, after being asked what appetizers she would recommend, was very snarky in her response and made sure to tell us that we would have to order from our waitress when all we wanted were some suggestions. It was as if we weren’t supposed to talk to her. But aside from the service, the Farm Thai Pizza is excellent. It’s $12 and only available during the month of September. Get it while you can. Next articleGabby’s Peruvian Restaurant and Catering has a new menu and it’s worth it!